Earn $2.17 in Rewards credit (217 points) What's This? With its beginnings under Vittoria's off-road brand Geax, the Goma displayed itself as a champion among Enduro and all-around trail riders alike. Now that Vittoria has incorporated their mountain-bike and road tires under one name, the Vittoria Goma 27.5" MTB gets a bit of a update as well, making it a better performer than ever. You'll find the Goma's familiar ramped center knobs for low rolling resistance carry over from the old Geax version, but a key feature that sets this tire apart is the stepped edges on the side knobs. According to Vittoria, this stepping gives what is essentially an additional edge for cornering grip, so you can really dig into turns with confidence that these tires will stay under you. The spacing of the tread also provides great grip in loose terrain without collecting dirt or mud. 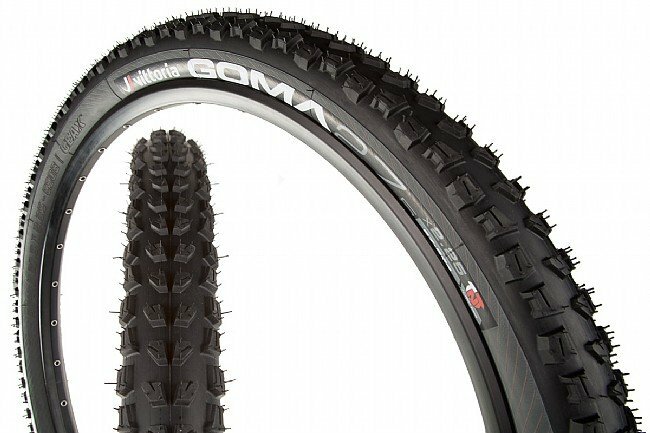 Vittoria set out with the Goma to create a tire that could handle anything that Enduro racing could dish out, and guess what - that's exactly what they got. The Goma TNT 27.5 Inch MTB Tire is available in 2.25 and 2.4 Inch widths with claimed weights of 750 g / 1020 g respectively. 120 TPI casing. Tubeless ready.